January 5, 2015 – IK Multimedia, the leader in mobile music creation, today announced it’s shipping iRig® Mic Field, the first ultra-compact, stereo digital microphone for audio and video field recording on iPhone, iPad or iPod touch – including the new iPhone 6, iPhone 6 Plus, iPad Air 2 and iPad mini 3. Slim, light and fully rotatable, iRig Mic Field lets anyone make great audio and video recordings with high-quality stereo sound everywhere. iRig Mic Field is the only mobile digital microphone designed to be used for both video and audio projects. It delivers superb stereo sound by connecting digitally to iPhone, iPad or iPod touch via Lightning connector. Its two high-quality cardioid electret condenser capsules, 24-bit audiophile-grade A/D converter (with 44.1/48kHz sample rate), 115 dB maximum SPL rating and built in low-noise, high-definition preamp allow for pristine sound capture quality at rehearsals, concerts, lectures, speeches, music practice and more, as well as field recording and on-the-move videography projects. iRig Mic Field can create accurate and faithful field recordings in nearly every imaginable context. To better preserve the stereo image while recording audio for video, iRig Mic Field features a conveniently rotatable patent-pending design. With the touch of a finger it can be easily rotated 90 degrees and locked in one of two positions for an accurate stereo image in both landscape and portrait modes. This means that iRig Mic Field can record the proper left and right channel position in any situation – surpassing other mobile microphones that only produce a true stereo sound when held in portrait mode. iRig Mic Field is lightweight and portable. It has a slim form-factor and slips easily into a user’s pocket when finished. iRig Mic Field has been designed with elegance and durability in mind, and it can withstand the rigors of travel thanks to its durable industrial design and protective carrying pouch. 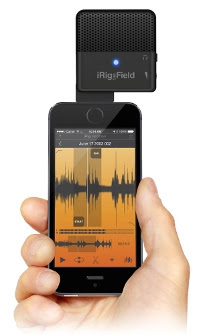 iRig Mic Field has also been designed with mobile video in mind. 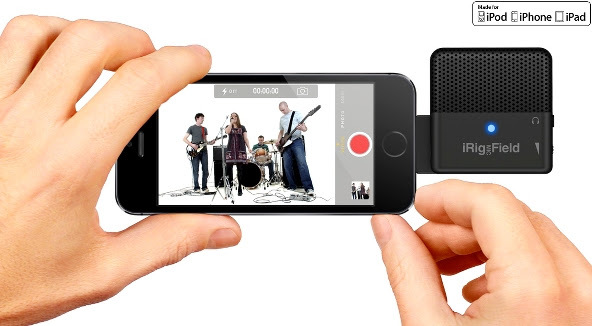 It can be used to record video on iPhone, iPad and iPod touch with crystal-clear, professional sounding audio. It’s never been easier to shoot a great sounding video and share it with friends, followers and fans. Now musicians, videographers, journalists, podcasters, casual users and more can get high-quality sound while on-the-go without sacrificing mobility or audio fidelity. Capturing good sound requires more than just high-quality components; it also requires comprehensive control. iRig Mic Field has everything needed to ensure that sound is recorded at the perfect setting. It features a thumbwheel gain control, an audio-out jack for quality real-time headphone monitoring and a multi-color LED input level indicator for quick visual monitoring. For immediate stereo recording, an update to IK’s iRig® Recorder app for iPhone, iPad and iPod touch will soon be available to fully support iRig Mic Field. iRig Recorder lets users quickly record, edit, process and share their audio, thanks to its intuitive GUI, 8 intelligent effects processors and sharing capabilities. iRig Mic Field also works seamlessly with a wide variety of apps including Apple’s GarageBand and iMovie apps, and iOS Voice Memo and Camera. iRig Mic Field is now available from music and electronics retailers worldwide, and from the IK online store, for only $99.99/€79.99 (excluding taxes).